The indigenous people living in the Helambu region are known as Hyolmo. The name, Hyolmo, is made up of two words, Hyol, or high area surrounded by mountains, and Mo, or goddess. The Hyolmos have close cultural and linguistic relationship with the peoples of Kerung and Rongsthar region of Tibet,China,Bhutan,etc. Helambu area in the north-west of Sindhupalchok district, east of Nuwakot district and in the south-east border of Rasuwa are the traditional homeland of Hyolmos. At present, about 500 families of Hyolmo live in Kathmandu, and a few have also settled in the United States and other countries. According to the census of 2001, the population of Hyolmos is 579, while those speaking the Hyolmo language is 3,986 and population is 1,00,000 is assumed including hyolmo people living in Darjeeling,Gorkha, Lamjung, Chitwan etc. The Hyolmo language is similar to a dialect of Tibetan Buddhist language, Most of the spoken dialect are Buddhist script.In Tibetan usually writing and spoken are not similar.Holly book of Buddhist dialect had used Hyolmo dialect. The purification ceremony undergone after the birth of a child by the mother and those relatives and neighbors who touch her is known as (Sang) Thaapsang or Depkiserkim.Purification ceremony or Puja is depend upon Lamas but in general is called "Sang and serkim". There is the practice of marrying one's maternal uncle's or aunt's daughters. The boy goes to ask for the hand of the girl . When going to ask for the girl's hand alcohol in the "Thambe" special wooden pot called "Shayalgar "traditional Hyolmo wine wooden container have to be taken. The boy is adorned with tika of clarified butter (ghee on the head in three places. During the marriage ceremony, the Lama gives blessings, tika of clarified butter is put on his forehead, boys and girls sing and not all but some places the tail of yak (Chamar) is waved . The marriage rituals are longer in the groom's house than in the bride's house after the bride is brought to the groom's house. The marriage altar is made in the groom's house. After a person's death, the dead body is kept from one to five days and sacred scriptures are read over the body. When the body is taken for burial, it is adorned like a groom and is carried in a palanquin. The purification ceremony (ghewa) is undertaken on the third or seventh week after death.In the ghewa there is practicing special mani song and dance which is introduced my Guru Padmasambava ( Guru rinpoche) The Hyolmos celebrates Sonam Lhosar which is earlier then Tibetan Losar on the time of Chinese new year. 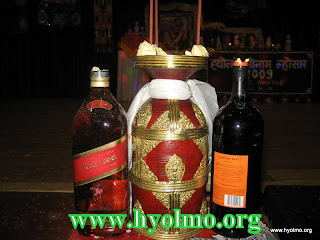 We use clarified butter as tika in all our ceremonies.On the occasion of Hyolmo Sonam Losar we make speical food called Derka Traditional home made Hyolmo wine (Chhyang or Aarag), Derka (A plate full of fruits and bread called Bhabar), Thunse (meat), butter tea. Our attire appears at first glance like that of any other Himalayan communities, but is slightly different and softer. 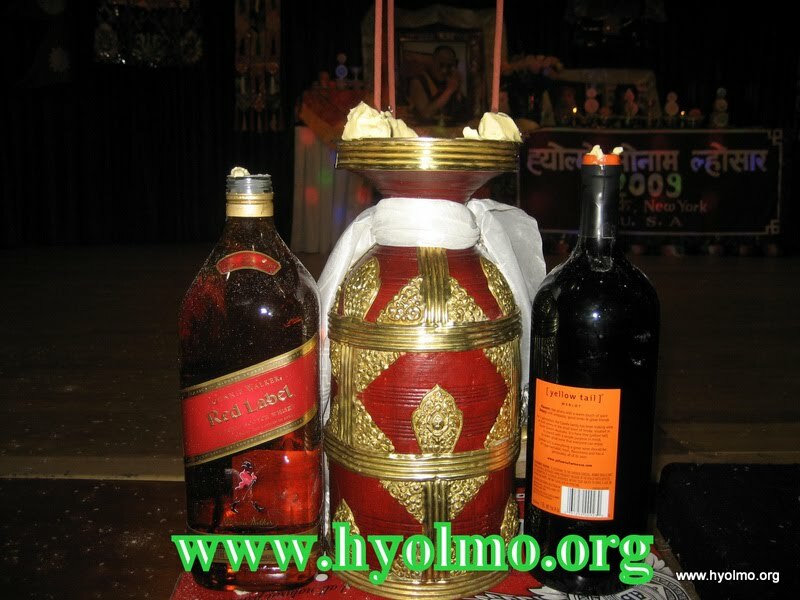 We Hyolmo people drink salt and butter tea which is called Soljya or simply "Jya"and container is called " Tibri". Festivals in Hyolmo begin with religion, ending as social event. There are more than 14 major festivals in a year celebrated by Hyolmos. Although most of these festivals are religious some have historical significance, while others are seasonal celebrations. NARA DRUNGRU FESTIVAL IN HYOLMO: ONE OF THE HYOLMO'S BIGGEST FESTIVAL. The lama has the main role in the social system of Hyolmos. Male cannot discriminate against women. The elites and elders have a special place in society. As Hyolmos are involved in trade, tourism and agriculture, they have a corresponding social structure. The Hyolmos are considered as leaders of lamaistic religion. Each village of Helambu have monastery. The entire social life of Hyolmo is religioun-oriented. Guru Padmasambava Rinpoche, who founded the modern Buddhist religious tradition in Tibet, had inaugurated a new tradition in the Buddhism of Hyolmo.Hyolmo is blessed by Guru Padmasambava (The ultimate source of all energy),Guru is also known as VAJRA unshakable, Ama Chhomo Yangri is deity ( protector of entire Hyolmo) and Jetsum Milarepa yogi from Tibet who meditated in Hyolmo and sang fondly of Hyolmo when he meditated in the Tiger Cave Lion Fortress (Ta-Puk-Senge-Dzong) in the 11th century. According to holly book and "Pema Kathang" Hyolmo is sacred place where people meditating in some other place for 3 years can go much deep within themselves if they meditate just 3 months in Helambu (Hyolmo). Helambu is named after it.In Helambu or hyolmo language "Hay" means potato and "Labu" means raddish. At the present primary occupation of Hyolmos is welcoming and looking after guests. 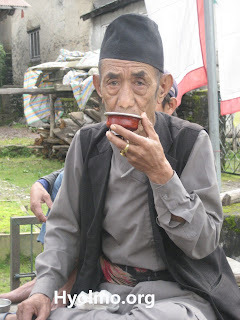 It is not an exaggeration to say that Hyolmos initiated and gave impetus to tourism in the northern regions of Nepal. The first main tourism point and tourist area of Nepal is the Helambu of Hyolmo. The second most important occupations of Hyolmos are farming and raising livestock, while the third is trade and business. The Hyolmos grow potato, carrot, maize, barley, wheat, lettuce, millet, apple, etc and raise sheep, yak and other animals.